At the Personal Enhancement Center we pride ourselves on providing the highest quality patient care. It is for that one reason that we offer all of our patients the concierge services that we feel will help each patient before, during, and after their surgery with Dr. Christopher Godek. Dr. Godek choses to focus not only on the surgical procedure but rather the entire Personal Enhancement Center experience. He believes that careful pre-operative planning and post-operative care can significantly improve your outcome. Dr. Godek encourages total physical and emotional wellness by combining our plastic surgery with an integrated program of skin care, nutrition, and personal training. As part of our concierge program you will receive a variety of services that are specifically geared towards the the of procedure that you are having. It is our belief that with proper pre and post care you will heal faster with less pain and less downtime so that you may get back to your normal activities. Facial plastic surgery is one of the most powerful tools available to reverse the effects of aging. Loss of skin elasticity and muscle tone of the face and neck are the chief complaints of our facial patients. There operations are usually performed on an outpatient basis with twilight or general anesthesia. Depending on your needs, Dr. Godek may perform other procedures that enhance these results. Together, both you and Dr. Godek will review each procedure and develop a treatment plan that is best for you. Body contouring surgery to enhance the appearance of your body can be a single procedure or multiple procedures. When diet and exercise just aren’t enough, procedures such as tummy tuck, arm lift, and body lift can help with excess skin. Liposuction helps to reduce stubborn fatty tissue. These procedures are usually performed under general anesthesia on an outpatient basis. 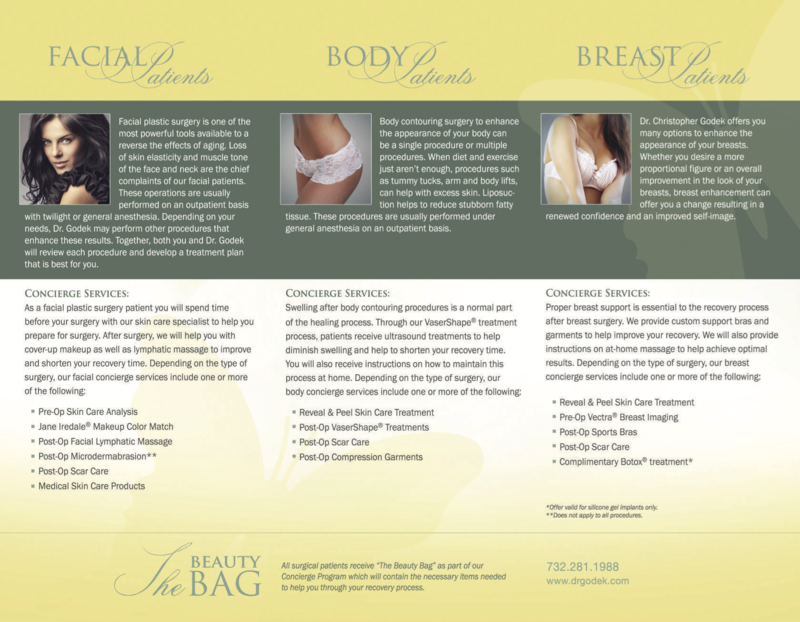 Dr. Christopher Godek offers you many options to enhance the appearance of your breasts. Whether you desire a more proportional figure or an overall improvement in the look of your breasts, breast enhancement can offer you a change resulting in a renewed confidence and an improved self-image. **Does not apply to all procedures. To learn more about how our comprehensive concierge services can provide you with better surgical results and a faster, more comfortable recovery, please call our office at (732) 908-2599 or contact us via email.